Rigid-frame engineering allows for precise building dimensions to be calculated and applied based on the equipment being housed. Nobody enjoys being forced into a decision. We usually like to consider our options, and the best option of all (of course) is getting something exactly the way we like it. Eating at a restaurant is a perfect example. Although most menus will have a wide selection of great entrée choices, many of us may prefer to make some tweaks to the standard recipe: wheat instead of white, grilled rather than fried, hold the mayo, etc. Whether it’s fast food or fine dining, about the only significant obstacle to customizing an order is poor communication. And if the waiter or cook gets it wrong, rectifying the situation may cost you a few minutes, but nothing more. The stakes are much higher when it comes to planning and executing a new building project. Finding the correct solution on the front end isn’t the only critical step in the process, but it may be the most important, as reversing that decision isn’t nearly as easy as yelling back to the kitchen for a re-do. 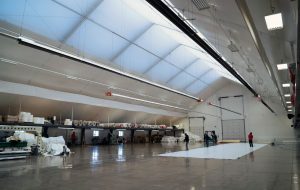 Fabric-membrane structures have proven to be a reliable, cost-effective building choice for a wide range of applications, including aircraft hangars, vehicle-maintenance garages, bulk-material storage, recreational facilities, and more. But for decades, the purchase of a fabric building always was a “from the menu” selection: standard pre-engineered sizes were available, and users picked whatever option most closely suited their needs and budget. Through the years, leading fabric building manufacturers have made strides to elevate their engineering, putting them more in line with conventional architecture. In contrast to the traditional fabric structure approach, these engineering upgrades are focused on optimization—specifically matching the building design to all aspects of the intended application. Optimization can be defined in a variety of ways within the context of construction. For fabric buildings, the first and most-obvious step toward optimizing a design is providing precise dimensions. 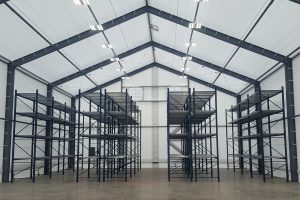 Consider an aircraft hangar, where facility codes require certain horizontal and vertical clearances depending on the measurements of the aircraft. With an older-style fabric structure, if the necessary building width to house a plane was determined to be 105 feet, for example, a manufacturer typically would offer the smallest size, measuring at least that width, from their existing pre-engineered stock … such as a 120-foot-wide building. It got the basic job done, but the excess footprint made it far from optimal. Addressing the need to meet more-precise building specifications, rigid-frame engineering was introduced to the fabric building market several years ago. Prior to this, the industry had been almost exclusively relying on pre-engineered, standard-size designs that used hollow-tube, open web truss framing. Rigid-frame design, by contrast, uses structural steel I-beams found in conventional building projects. It also allows the engineering flexibility to quickly provide a custom design from scratch, as the exact length, width and height of a building can be specified down to the inch. Offset peaks, variable column heights and other unique layouts also are possible. In a nutshell, this technique allows any building to be optimized for its specific use. Using steel I-beams in fabric building design allows for custom engineering and unique layouts. 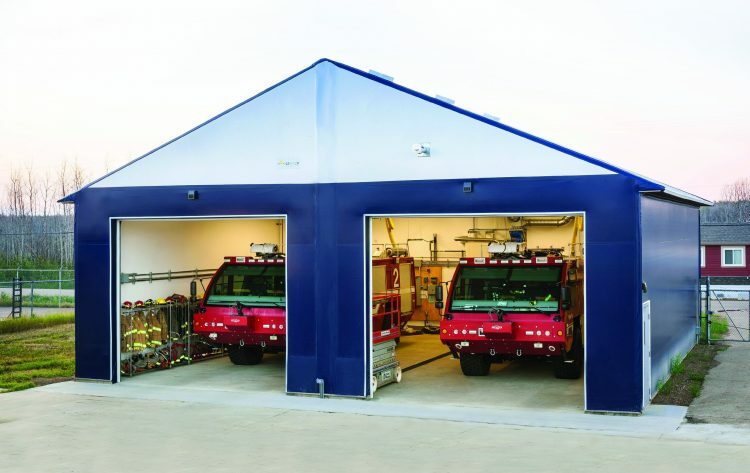 Fabric buildings with a structural steel frame can more easily be designed to accommodate any hanging or collateral loads. While fabric structures with curved sidewalls leave wasted square footage, straight sidewalls allow building users to place items against the wall to optimize the footprint. Beyond building dimensions, rigid-frame design also simplifies the process of accommodating any collateral loads that the building frame must support. Lighting and fire-suppression systems are common hanging loads for athletic buildings. Vehicle-maintenance shops often require an overhead crane, while a conveyor is a typical feature of a bulk-material storage facility. A large aircraft hangar might even have hanging and lateral loads associated with its massive doors. Using finite-element analysis software, engineers can modify and optimize each individual steel beam based on the actual loads that will be on it, rather than over-engineering an entire building frame to account for those factors. Structural steel framing also provides the advantage of straight sidewalls. This may seem like a no-brainer when considering the optimization of building square footage, but most traditional fabric structure designs have radiused (curved) sidewalls. 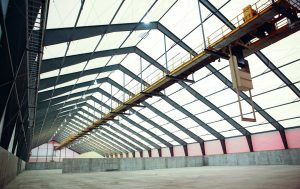 Building operators who plan to place or construct anything directly along a straight sidewall, such as container storage or mezzanines, can do so while specifying the exact vertical clearance needed. For example, a building user who wants a pallet rack for storage can place it flush against a straight sidewall. But if that sidewall is curved, the same rack needs to be moved in from the wall to fit vertically, leaving wasted square footage behind it. An optimized profile can reduce lighting and HVAC requirements, providing significant cost savings over the building’s lifecycle. Building frames can be proactively engineered to carry loads such as solar panels immediately or during a future retrofit. 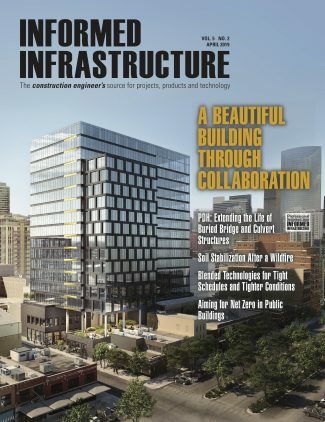 Although immediate space utilization is a critical component of building architecture—and a major factor when choosing between custom and pre-engineered designs—there also are numerous long-term considerations to keep in mind. Optimization of the building profile helps ensure operational cost savings in a variety of ways. An oversized, pre-engineered building will require more lighting, along with a larger HVAC system to heat and cool the space. Building applications requiring insulation also could incur more costs. Minimizing these types of expenses through a more energy-efficient design can have a significant financial impact over the lifecycle of a building. Another issue to consider is current investment vs. future need. 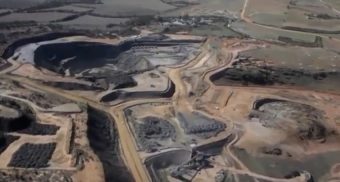 It’s no secret that many industries have been trending toward the use of alternative energy sources. Some military and aviation facilities, in particular, have been designed to operate “off the grid” by using solar panels. 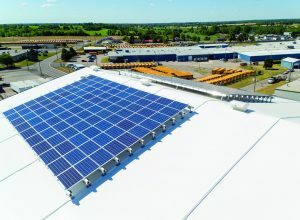 In other cases, solar panels weren’t feasible in the original budget, but the building frames were proactively engineered to carry that type of load during a potential future retrofit. 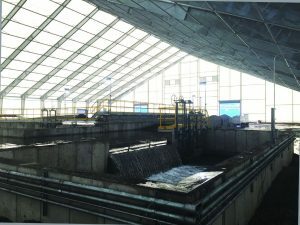 Building style and shape have a major impact on the interior functionality of a fabric structure, but those characteristics also should be closely examined when it comes to managing water, ice and snow. Whether it’s a classic half-circle “hoop-style” structure or a building with more subtle curvature to the sidewalls, traditional fabric buildings all experience the same problem of snow, water and ice all shedding right down to the structure’s base. Unless users have an excellent drainage system or a site that significantly slopes away from the edge of the building, they’re likely to be fighting water infiltration issues and possibly foundation cracking for as long as they have the building. In extreme cases, poorly tuned ventilation can eventually cause leakage issues on the building’s interior. By contrast, the more-conventional building approach of rigid-frame design allows for an 18-inch overhang on the structure’s eaves. From there, users can specify any water- and ice-management features they need. Icebreakers can be added to meet safety requirements related to sidewall height. Gutters and downspouts can be included to capture and jettison water away from the structure, providing optimal environmental conditions for the building exterior and surrounding site. 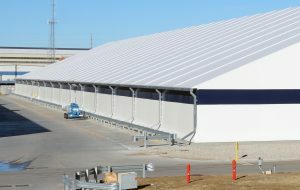 Classic fabric structures often experienced water-management issues due to their curved sidewalls, while modern fabric buildings can be equipped with gutters and downspouts. With the ability to provide end-to-end services from design and manufacturing to installation, suppliers are better able to adapt to potential issues during a project. The actual end-to-end, start-to-finish construction process of a fabric building also widely varies from one supplier to the next, and there can be dramatic timeline or procedural differences at every step along the way. Although it sounds counterintuitive, it could take several weeks or even months to finalize the design of a pre-engineered building, simply because they’re not as adaptable to even small levels of customization. Meanwhile, the engineering for a fully customized rigid-frame design can be rendered in a matter of days. From there, many fabric-structure manufacturers rely on third-party suppliers for building components. However, some companies have invested in their own onsite facilities to manufacture fabric panels or produce steel frames and components, allowing them to maintain a higher level of precision and quality control over their product. Delivery methods among suppliers also have wildly differed through the years. Common practice for many manufacturers is to provide a supervisor to oversee installation, leaving the customer to arrange for hiring their own subcontractors to address the various aspects of construction. Some manufacturers have found that a more advantageous approach is to provide their own inhouse professional installation crews who are specifically trained to erect fabric structures, helping to ensure a fast turnaround and optimal final result. The philosophy of companies such as Legacy has been to provide a one-stop shop for all of these services, from initial design to final turnkey and handover. With the ability to fulfill any and all roles—including design, manufacturing, general contracting, construction management and installation—suppliers can more-easily adapt to potential issues throughout the project. There also are multiple benefits from a customer standpoint to going through an end-to-end process with a single company. Having the building manufacturer involved in every phase typically provides greater opportunity to recognize opportunities for cost savings or improvements early on. 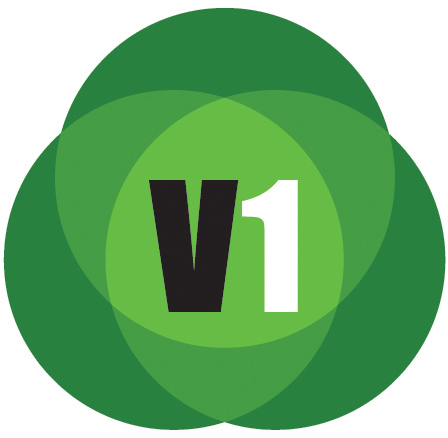 On a basic level, if issues arise, the customer knows exactly who is responsible and who to call. And for suppliers who are insurance bondable, customers can go into the process with greater peace of mind. At the end of the day, fabric building optimization is all about somebody fully understanding what the application is and making the adjustments to ensure the structure meets all necessary requirements. Find the proper solution and people to lead you down that path, and you can feel confident of receiving the best possible outcome. Jeff Williams is vice president of sales, and Scott Jones is construction manager, Legacy Building Solutions; email: jwilliams@legacybuildingsolutions.com and sjones@legacybuildingsolutions.com, respectively. Why the Upsurge in Microgrid Development?